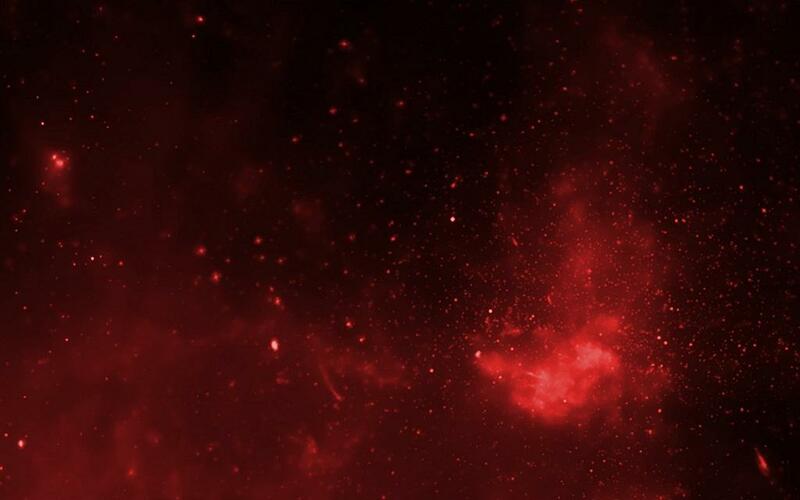 Astronomy, to many people, may seem like a subject far removed from their daily lives. When children ask us how we know so much about the Universe, we usually shrug our shoulders. However, many of facts that we learn in school about the Earth and the way it moves can indeed be deduced by children themselves using simple means. The history of measuring time and of navigation is pretty much the history of astronomy. How did we first figure out how to tell time, how to determine the cardinal directions at any given place, how to measure its latitude, how seasons are caused, or what the tilt of the rotation axis is? More interestingly, can we find out for ourselves, at home or at school, the way it was done centuries ago by different civilisations? Yes, we can. That is the aim of the Zero Shadow Day (ZSD) campaign of the Public Outreach and Education Committee (POEC) of the Astronomical Society of India. The committee is using the Zero Shadow Day to enable school children to understand all these questions using the shadow cast by the Sun. The committee has collated all necessary information on ZSD on its website and has also developed an android app called `ZSD’ to help find ZSD for specific locations. The app is available in many Indian languages. You may have noticed that south facing windows get direct sunlight in winter, or if you have an east or west facing window, that the Sun does not rise or set at the same point every day. If you live in the northern part of India, you will even have noticed that the length of the day time is much shorter in winters. All of these, including the seasons themselves, happen because of the tilt of the Earth's axis. Our equator is defined as being perpendicular to its rotation axis. However, this equator is inclined at 23.5 degrees with respect to the Earth's orbit around the Sun. Hence, our rotation axis is also tilted at this angle from the axis of revolution around the Sun. Now, as the Earth rotates once a day, all stars as well as the Sun seem to rotate around us daily in paths that are parallel to our equator projected on the sky. However, because of the tilt of the axis, the daily path of the Sun slowly moves northwards and southwards over the period of a year. Because the tilt angle is 23.5 degrees, the southern- most path of the Sun, at Winter Solstice around 22 December, is 23.5 degrees south of the equator. This means that on this day, the Sun will be directly overhead at noon for places on the Tropic of Capricorn at 23.5 degrees south latitude. Similarly, the path of the Sun on Summer Solstice around 21 June is 23.5 degrees north of the equator. This means that the Sun is directly overhead at noon for places on the Tropic of Cancer at 23.5 degree N latitude. During spring and autumn equinoxes on 20 March and 23 September respectively, the path of the Sun is exactly on the equator and hence will be directly overhead for places at 0 degree latitude. 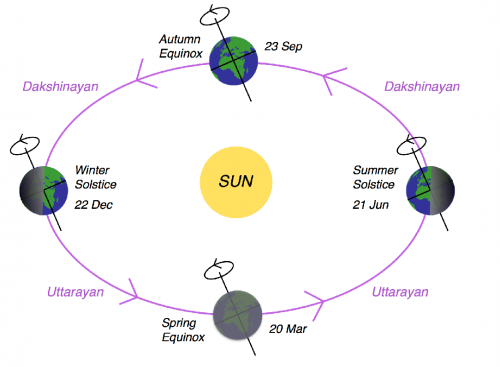 This journey of the Sun from Winter Solstice to Summer Solstice is called `Uttarayan’ and the return journey is called `Dakshinayan’. In this annual journey, the location of the Sun when it is highest in the sky will not be directly overhead every day. Instead it will pass either a bit north or a bit south of the zenith, or the point directly overhead. If this is so, then any vertical pole will still cast a shadow even at local noon. It is only when the Sun is at the zenith itself that such a pole will cast no shadow. We know that the apparent path of the Sun goes from 23.5 degrees south of our equator to 23.5 degrees north of it through the year. Therefore for all places on Earth which are between the Tropics of Cancer and Capricorn, the Sun, when it is at its highest point in the sky at noon, will be directly overhead twice in the year – once during `Uttarayan’ and once during `Dakshinayan’. These are called Zero Shadow Days or ZSDs for that location. The ZSDs progress northwards till 21 June and goes southwards thereafter. For example, it occurs on 15 April and 27 August in Kochi, 24 Apr and 18 August for Chennai and Bengaluru, 9 May and 3 August for Hyderabad, 15 May and 28 July for Mumbai, 5 June and 7 July for Kolkata and 8 June and 4 July for Indore (which is near the Tropic of Cancer). If you live in Andaman & Nicobar, Kerala, Tamil Nadu, Lakshadweep, Puducherry, Karnataka, Telengana, Andhra Pradesh, Goa, Maharashtra, Chhattisgarh, Dadra and Nagar Haveli, Daman and Diu, or the southern parts of Madhya Pradesh, Gujarat, Jharkhand, West Bengal, Tripura or Mizoram, you will get two Zero Shadow Days every year. For other locations which are above the Tropic of Cancer, the noon-time shadow will be shortest on 21 June, but not quite zero. Places along the Mangalore-Bengaluru-Chennai latitude experiencing ZSD (on 24 Apr), which is currently moving northwards. Understanding the motion of the Sun, the tilt of the Earth's axis, and even how to tell time can all be done with just one equipment and which too is deceptively simple – a stick planted on the ground. Called shanku in Indian astronomy traditions, and gnomon in the west, such a stick and its variants have been used in every civilisation in the world for thousands of years. Many ancient astronomers like Aryabhata, Varahamihira and Bhaskara had written about its usage. Niruj Mohan Ramanujam is a radio astronomer and a member of the Public Outreach and Education Committee of the Astronomical Society of India.